PT Wijaya Karya Beton Tbk - WIKA Beton (IDX : WTON, listed since 8 April 2014) is a well established public listed company in Indonesia, headquartered in Bekasi West Java and running business in precast concrete industry. WIKA Beton is a directly-owned subsidiary company of state-owned construction giant PT Wijaya Karya (Persero) Tbk (WIKA Group). As of December 2017, WIKA Group holds 60% shares in WIKA Beton. Another 40% are owned by Koperasi Karya Mitra Satya (6.93%), Treasury Stock (4.33%), WIKA Foundation (0.99%) and public shareholders (27.75%). 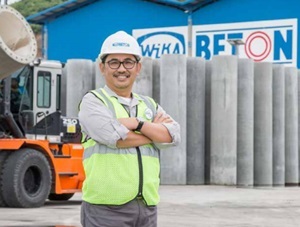 WIKA Beton runs its business through 14 concrete plants, 1 mobile plant, 3 crushing plants, 6 marketing offices and 2 representative offices spread across Indonesia. WIKA Beton also supported by 3 subsidiaries and 1 affiliated; PT Wijaya Karya Komponen Beton, PT Wijaya Karya Krakatau Beton, PT Citra Lautan Teduh, PT Wijaya Karya Pracetak Gedung. In the business year of 2017, WIKA Beton succeeded in posting excellent financial performance. According to PT Wijaya Karya Beton Tbk Annual Report 2017 as cited by JobsCDC.com, WIKA Beton registered total revenue of Rp 5.36 trillion in 2017 or up 54.01% from Rp 3.48 trillion in 2016. Total profit in 2017 amounted to Rp 340.46 billion. This number is equivalent with an 20.67% increase from Rp 282.15 billion in 2016. Referring to its annual report, WIKA Beton registered a 20.74% growth in total asset of Rp 2.68 trillion as compared with Rp 2.22 trillion in 2016. A minimum TOEFL score of 500 (issued from credible institutions, can be proposed). Mastering computer software applications in their fields. Good medical history (balanced body weight). Not color / total (partial). Have motivation, energetic, adaptive, and able to work in teams. Willing to be placed in all business units and operating areas of the company. JobsCDC.com now available on android device. Download now on Google Play here. Please be aware of recruitment fraud. The entire stage of this selection process is free of charge. PT Wijaya Karya Beton Tbk - Fresh Graduate Program WIKA Group February 2019 will never ask for fees or upfront payments for any purposes during the recruitment process such as transportation and accommodation.